The Kalash people, or Kalash as they are generally called, live in three remote valleys in the North-Western province of Pakistan, close to the Afghan border. 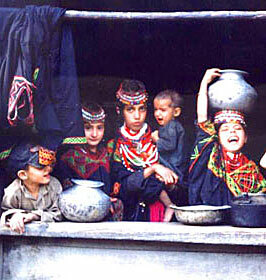 Chitral is the main staging post of all three valleys. Chitral, which has an elevation of 4,980 feet, lies in the heart of Marco Polo land, nesting between the rugged mountains of the Hindu Kush – ‘Slayers of the Hindus’. According to historian, many slave children, brought from Kashmir and beyond, died on their winter slopes.